Magellan Health is a leader in providing health care solutions to large organizations, including Federal agencies. When the Departments of Defense and Veterans Administration had increasing needs for services to address both physical and mental needs of returning and aging Veterans, it decided to launch an entire new division dedicated exclusively to the needs of the military and Veterans, as well as other agencies such the Federal Aviation Administration, where stress is a part of the job. 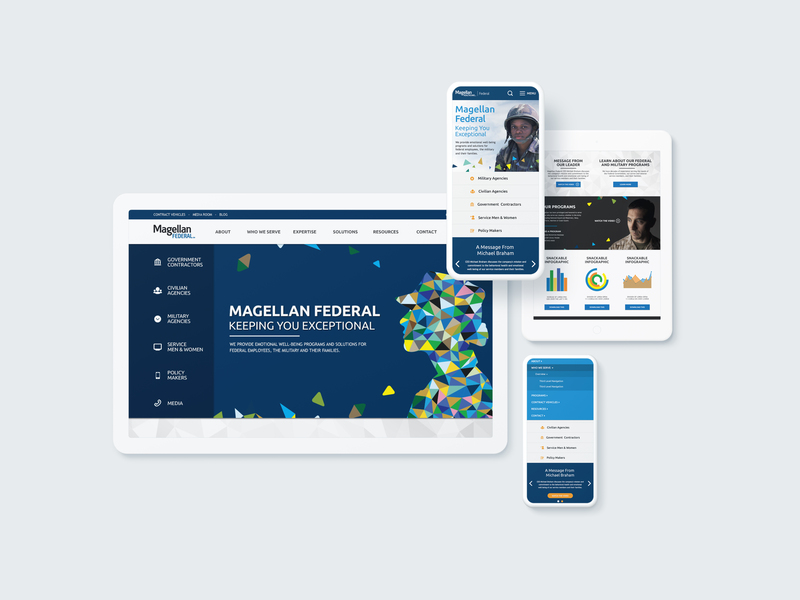 When Magellan Health launched its new Federal division, it turned to Bluetext to develop its brand and a powerful new website to inform government leaders how its approach to emotional well-being could help thousands of veterans and service personnel. These Invisible Wounds – which may not be seen but that impact many of servicemen and women who have served overseas – became the major theme for the new brand. A key component in the campaign was an outreach program to bring attention to the large number of suicides among Veterans and how individuals, caregivers and government agencies could better identify those with significant emotional health challenges and channel services to them as quickly and effectively as possible. We called this the “22-0” campaign, after the astounding government statistic that an average of 22 Veterans were taking their own lives every day. The goal of the campaign was to bring this number to zero. Heighten national engagement in suicide prevention and a zero suicide culture within the military and Veteran community. Encourage users to change their profile image to campaign logo and promote via Facebook and Twitter. Share inspiring, informative, and actionable content about suicide prevention. Partner with key organizations involved in the Veteran and mental health community to drive awareness and recruit campaign support. Drive awareness of the primary mental and emotional health factors that can lead to suicide. Associated the Magellan Federal brand with suicide prevention among Veterans. 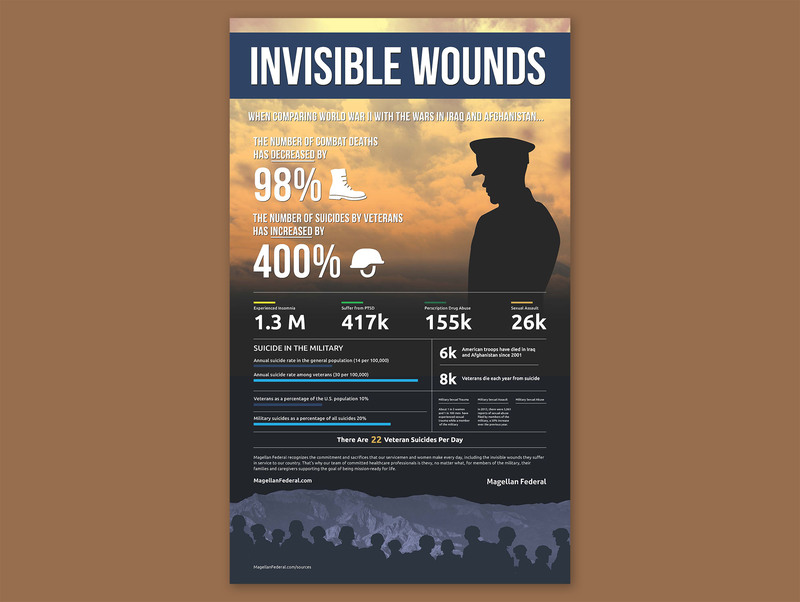 The campaign was built around compelling graphics telling the toll that service has had on our warfighters, including the high rates of suicides. We aggressively pushed out the graphics through social media to bring attention to the reality of the wounds many of our troops are facing once they return home. In addition, a paid media campaign was launched that included banner ads in key publications; a Facebook component that allowed users to insert a 22-0 graphic over their own portrait photos, and a LinkedIn campaign to reach groups on that platform that were involved in Veterans services or organizations. Recovery Innovations shared the campaign with the Department of Veterans Affairs. MHA of NYC sent out dedicated tweets about the campaign, reaching their 7,038 followers. GI Film Festival sent out dedicated tweets, reaching their 8,210 followers. The organization also posted on Facebook, reaching 7,911 people. Stop Soldier Suicide promoted 22to0 on Facebook, reaching their 211,042 followers. 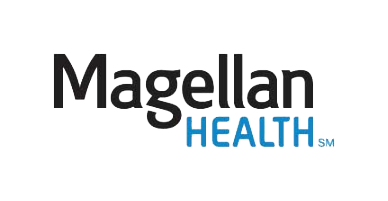 With Magellan Health, cutting-edge campaigns means reach to its customers. We can do the same for you.